An old street woman gives Alyssa Myles, Jack Boniface’s friend (and Shadowman’s abettor!) a vial of perfume called Follow Me Boy. Alyssa brings the mysterious potion with her to the museum for dinner with Jack. Opening the vial she falls into a trance-like state and is drawn by an uncontrollable force to a plantation sunk in the steamy, fetid swamps outside New Orleans. Jack has no choice but to do as the perfume orders, following Alyssa into a nightmare world complete with powerful Voodoo curses and itchy-fingered Brethren gunmen. While chasing Alyssa down, Jack calls Dox, who warns him not to get into any trouble until night falls and he can become Shadowman. But it’s too late for that now and an entirely human and vulnerable Jack Boniface must face his darkest hour alone, before dragging Alyssa into the Deadside where Shadowman and his stricken friend are forced to confront and conquer their greatest fear – the dark, turbulent seas of their mysterious, unresolved past. I’ll admit to being a wee bit biased when reading this novella. It encompasses many things I love: New Orleans, VooDoo, and the wicked words of Delilah S. Dawson, for whom I express much fangirl squee. Though, initially, I was mildly suspicious of the whole concept of Kindle Worlds, this introduction into the new form had me clamoring for more. Dawson’s take on Valiant’s “Shadowman” comic book series concerns Jack Boniface and the many threats in his world, some personal, some very personal. Dawson’s treatment of Valiant’s mythology is respectful, creative and a beautifully crafted “tip of the hat” to the beloved series. She takes the canon and twists it, makes it her own and certainly leaves and indelible mark with intricately imagined characters and a city that lives and breathes right along side the folks that inhabit her. 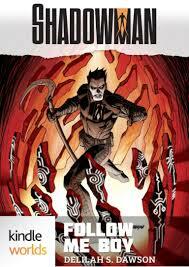 I’m crossing my fingers that Dawson will get another crack at Shadowman’s world.